Today’s presidential contest falls the day after a major anniversary—the hundredth of the first woman’s election to federal office. Via the New York Times Machine. 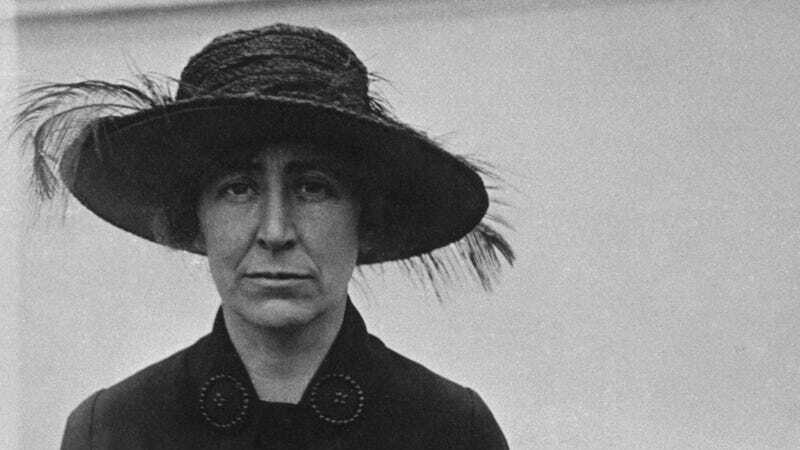 According to James Lopach and Jean Luckowski, authors of Jeannette Rankin: A Political Woman, what made it happen was a combination of her ground game, which built on her time spent campaigning for women’s suffrage in the state—“She had built a tremendous base of women who were very loyal. They had clubs and she organized them,” Luckowski told Time—as well as her alignment with the then-hot temperance movement, the support of her influential and well-connected brother, and finally the fact that at the time, Montana didn’t divide the state into congressional districts but rather just sent the two folks with the highest share of votes. Rankin wasn’t shy about gunning for the second spot. Former U.S. congresswoman Jeannette Rankin (R-Montana) prepares to leave Washington, June 2, 1932, for a speaking tour calling for a peace plank in the Republican and Democratic party platforms. As the first woman elected to Congress, she did not vote for war in 1917. Photo via AP Images. Rankin would serve one term then make a run at the Senate but lost, thanks in no small part to her pacifism and her controversial decision to vote against America’s entry into World War I. However, she would run again in 1940 and win—only to vote against American entry into World War II, which was even less popular than her first time around. (Rankin was literally the only nay.) She didn’t run for re-election, but she continued her anti-war activism, leading a peace protest on Capitol Hill in 1968, at the age of 87. Members of a women’s brigade hold a banner protesting the Vietnam War at a march led by former Montana congresswoman Jeannette Rankin in Washington, D.C. on Jan. 15, 1968. Behind them are other protesters and the U.S. Capitol building. Carrying the sign, from left, are: Ruth Krause, Mrs. Vel Phillips, Wenn Griffin, Ruth Warwick, and Lucy Montgomery. Photo via AP Images.